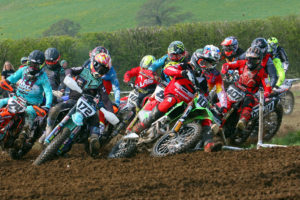 The Steel Hawk Motorcycle club defied all of their time constrained boundaries to stage their first ever “Rock it ’til Sundown” Mid Week Motocross Classic at Tincleton in Dorset yesterday. In just 4 weeks the club, with fantastic support from from title sponsor Jason Lewis and his company C.J.T Mechanical Engineering Services Ltd, the MCF, Ringwood MXC, and the landowner Lee Ford, pulled it off, and a fantastic crowd turned up to witness, what is hoped will be the first of many events the club promote in the future. The day time event started with practice and timed qualifying with the Adult groups being the first to test out the prime and revamped circuit that had been worked on for two days by Justin Barclay, and which offered some unique challenges to the riders on the sand based circuit. Adam Harris – Adult A class hero who became the underdog and qualified all the way through to the Pro Final! With the fastest 36 riders lined up for the first race of the day in the Adult A class, it was Adam Harris who showed a liking to the circuit and he went unbeaten throughout the day to take the class win and the prize money. Ryan Butler built up his speed throughout the day and with second in the final moto secured second overall. 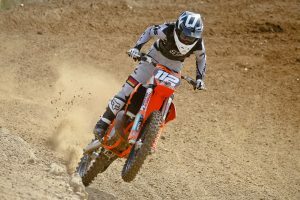 Luke Sturgeon posted two seconds places in the opening two moto’s but his third moto was to be his downfall and he slipped to third overall, just one point behind Butler. 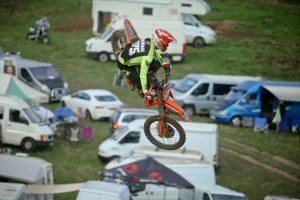 Local racer Josh Bunter strung three strong and consistent rides together for fourth overall with One Twenty Motorsport’s George Purchase fifth, and In Chains racer Ben Milward in sixth. A special mention must go to Dirt Hub’s George Walker who in his first ever race meeting qualified for the A group and finished a credible 26th overall. Next up was the Adult B and Vets combined race, and it was no surprise to see the evergreen Terry House take the top step of the podium of the Over 4o’s class with three wins. Steve Elford kept House on his toes though any any slip up from the front runner would have seen him in the lead. Elford finished second ahead of Chris Brown who showed great speed in third. 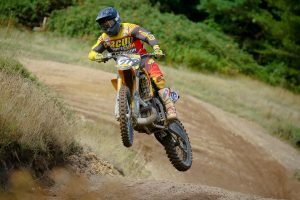 A host of other names from local motocross past also made an appearance in the Vets including, Paul Denning, Ross Sturmey, Scott Empson and Shaun Perrett. The much awaited appearance of Steel Hawks very own Jeff Perrett failed to materialize, as he realized life running events is not conducive to a race comeback. Maybe next year Jeff! Aaron Booker was untouchable in the Adult B class and maybe more Weetabix for breakfast before qualifying would have put him in the A class. 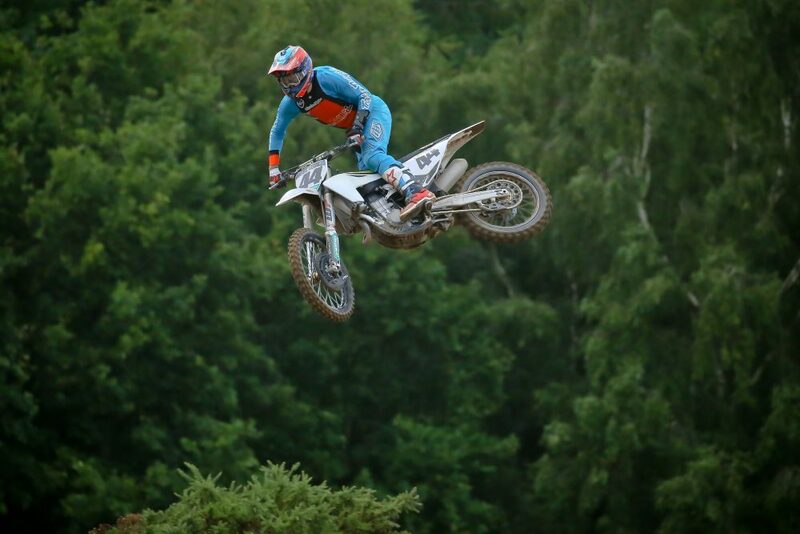 Mark Oakley performed well in all three moto’s for second overall, with a fantastic third from Sam Noye. The Junior 65’s was a super fast class and the little racers certainly enjoyed the circuit. Kenzie Cole was in his element and looked a class act as he ripped to three moto wins for the overall and a huge prize haul of goodies from the likes off Teng Tools, Duck Smart and Race FX. Behind Kenzie is where the battled raged for the second spot, with Archie Hobbs just getting the better of Zane Stephens in the final moto to land the number 2 spot, with Stephens taking third overall. Benjamin Sullivan brought his A game to the final moto finishing second and giving him fourth overall. There was certainly no holding back from these kids and there were epic battles all the way throughout the field. The mixed 85cc class was stacked with talent, and these young racers certainly used the Justin Barclay prepped circuit to get some huge airtime. Team Green’s Ben Mustoe took two race victories to claim the overall win in the Small Wheel 85’s with some tidy riding throughout the day. Second placed Henry Life made sure it wasn’t easy for Mustoe though, and claimed a tremendous win in Moto 2 keeping his Kawasaki rival a safe distance behind for the whole moto. The battle for third place was awesome to watch between Harrison Greenough and Louis Vincent, but in the end the big air loving Greenough claimed victory over his rival to stake his claim on the final podium spot. Great racing guys. A special mention must go also to Beanie Reece who enjoyed her first ever meeting and rode amazingly well throughout the day. In the Big Wheel 85’s there was no stopping Jude Morris and he roared to three race wins from three, although there was a worrying moment for him at the start of the final Moto when his machine wouldn’t start. 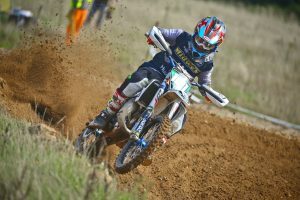 The best of the chasing pack was Raife Broadley, but it certainly wasn’t a clear second as local racer Shay Arnold and Harvey Cashmore were right in the mix and both beat Raife in the opening Moto. It was Arnold who grab the third spot though ahead of Cashmore. Another class which was packed with talent was the Rookie class with the points scoring being split for the 125 2 stokes and the 250f’s. 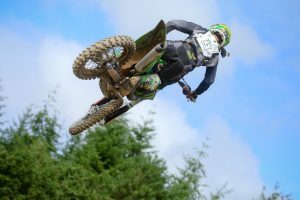 Bobby Bruce marked his introduction to Dorset with a stunning three ride maximum and certainly got to grips with the circuit and showed immense speed in all three motos. Louis Kessell is certainly showing a liking to his 125 with three good seconds for the number two spot on the podium, with Ollie Cole getting the better of Sonny Smythe and Ben White for third. In the Rookie 250f’s local lad Callum Gordon made the holeshot in moto one, and kept his cool to take the win from rival Ben Clayton. The roles were reversed in Moto 2 with Clayton taking advantage of a Gordon mistake to take the victory. 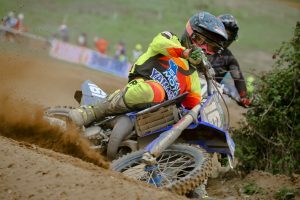 With it all down to the last moto for the Overall, the battle raged between the top two protagonists at the head of the field. Clayton was holding the lead but disaster struck for Gordon as he crashed out with two laps to go whilst building up a challenge for the lead. Clayton went on to win the Moto and the overall with Lewis King London who rode well all day second. Local lad Travis Reynolds rode well to edge our Tobias Sammut for the final place on the box. After dual crashes in the opening Adult A class needed two ambulances, the meeting was held up for over an hour and a half. With the Pro riders turning up and the evening meeting start time dawning, the decision was made for the evening finals for the those who couldn’t race their third block to be counted as their third point scoring ride. This would also double up as the winner takes all final with the big haul of prizes on the win. A BMX courtesy of the Stolen BMX Co and a 2019 Thor kit was on the line for the winners of the 65, and 85 youth classes and it was Kenzie Cole in the 65’s, Ben Mustoe in the Small Wheel 85’s and Jude Morris in the Big Wheel’s who all pedaled away on their new bikes. The Rookies also had a BMX up for grabs along side an Energy pack from Generate products, and a pair of Melon Goggles, and it was Bobbie Bruce and Ben Clayton who won their respective classes. The Vets class winner was none other than Terry House who has a hefty haul of goodies for his endeavours including a Pair of TCX EVO Comp Motocross Boots kindly sponsored by Nevis Marketing, a Bel-Ray Maintenance Pack, a Talon Sprocket set, and a Dirt Bike Rider and TMX annual subscription. Adult B winner Aaron Booker also has a good few prizes to his name with the same prize stash as Terry minus the boots. The Adult A racers were the busiest of the day with an fa cup style qualifying system meaning the top 6 from their evening final would qualify through to the Pro ranks and race for the big money on offer. 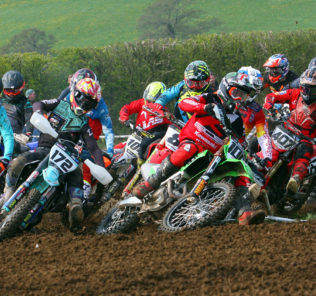 Joining the Pro riders were Adam Harris, Ryan Butler, Luke Sturgeon, Mitch Young, James Kensington and Ben Milward. As the Pro riders lined up for their first heat the crowd really started to pile into the venue, finding a number of vantage points to see the action including at the back of the circuit, where the full view of the action could be seen. From the offset Geartec Husqvarna’s Elliott Banks-Browne was in no mood to mess around and go the better of local favorite Jake Shipton for the Heat 1 win. Adult A winner Adam Harris proved a surprise package and used his day time race experience to good use to finish third ahead of a host of big name pro riders. In a close fought heat two Liam Knight got the better of Josh Gilbert who pushed his rival right to the flag. In heat three Banks-Browne once again exerted his authority with a win over Gilbert and Shipton, while Knight also pulled off his second win in Heat 4 ahead of Icelandic racer Eythor Reynissan and Taylor Hammal. With the top 8 point scorers through to the heats the knock out races were up next with the top two riders of each semi making it through to the final. Ryan Houghton and James Harrison made the most of Semi 1 with 1st and 2nd with Luke Norris and Jordan Booker mirroring that in Semi 2. With just two spaces left from the LCQ Matthew Bayliss and Michael Ellis secured their spots with 1st and second. Spare a though for Mitch Young from the Isle of Wight who rode in 9 races in the day as he battled through the Adult A qualifiers, the Pro Heat’s, Pro Semi’s and the LCQ. All eyes were on the 14 riders as the gate dropped for the Pro final and after a some close first bend tussles it was Banks Browne who emerged in the lead from Gilbert. Banks-Browne looked in control the entire moto although Gilbert was always in striking distance but just couldn’t quite get close enough to mount an attack and make a pass. Banks-Browne though had the edge and took the chequered flag from Gilbert with Shipton working his way into third to the delight of the Dorset crowd, with Liam Knight in fourth, Ryan Houghton fifth and Jordan Booker 6th. Huge credit must go to Adam Harris though as the only Adult A rider from the day to qualify through to the Pro final where he finished 13th. So it was Elliott Banks-Browne who banked the £1200 prize and won the huge Bob Lewis Memorial Trophy which was presented by Bob’s son Jason in an emotional but celebratory presentation at the end of the day. If this was achieved in four weeks imagine what can be done with a years planning. Roll on 2019 and the “Rock it ’til Sundown” meeting being on the calendar for many years to come.